I think I enjoy lunches the best. They are easy, I can pack them full of veggies, and try combos on myself before I try them on the rest of my family. This is one of my favorites. If hummus and fresh crunchy veggies taste good, then why not soft veggies? Amazing. I water saute whatever vegetables I have lying around and cook up a fresh tortilla (thanks to the uncooked tortilla packs we buy from costco - one of the things I don't worry about making on my own). 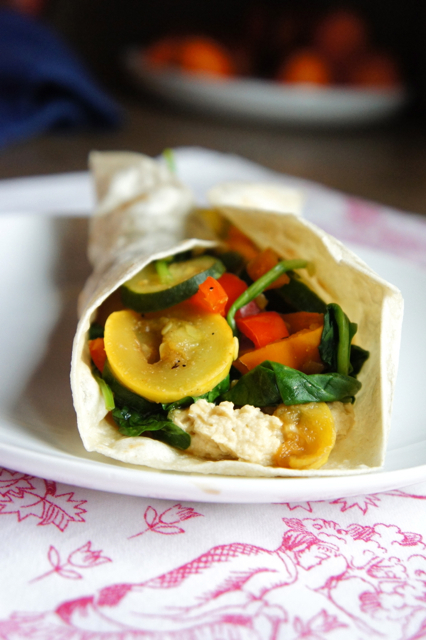 Spread your hummus in the tortilla and top with your veggies. It's so good. I wish I'd had that instead of homemade noodle soup. It's a sick day today. My 6-year-old is getting over a 104 degree fever. Today is much better and he hasn't been knocked out like he was all weekend. I'm just hoping it doesn't plow us all down. Since he's just barely getting his appetite back, I whipped up some noodle soup and ate it with the kids. It was perfectly warm for today. I love having a meal plan for the week. Last week I had my plan, but sometimes as the evening approaches, it sounds like too much work or too time consuming. Ever happen to you? Well, I did it. I followed through and it wasn't hard, was super tasty, and making some Whole Wheat Pancakes really wouldn't have been that much easier. 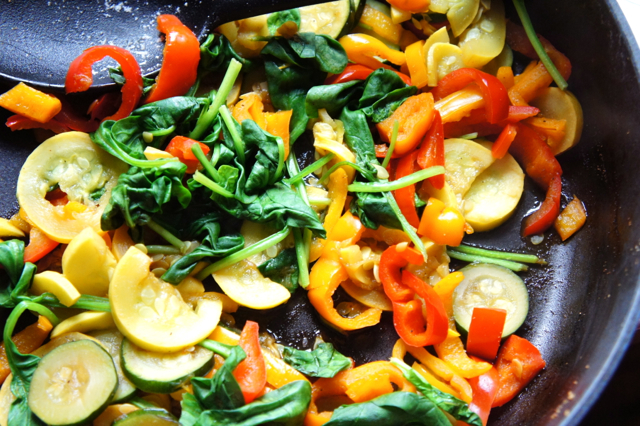 Use any combination of veggies, sliced and diced. Saute with salt, pepper, and garlic powder to taste. Serve on top of fresh greens, topped with hummus. Or serve on fresh tortilla, spread with hummus, topped with the veggie mix.